My show CONTACT, is featured at By Hand Gallery from June 1st—July 31st, 2018. This exhibit is a new body of work. 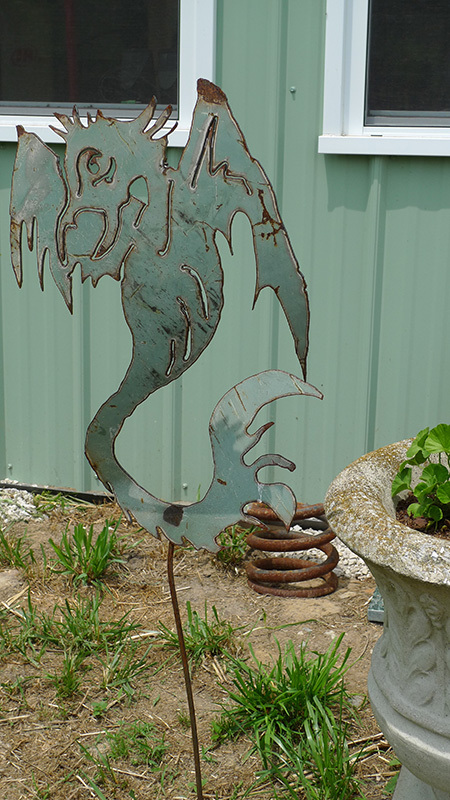 Most pieces are of forged and fabricated steel with some glass elements. One, Snake Goddess: Circle of Life (Minoa), is hand-carved limestone. I’ve included here my artist’s statement which tries to codify in several paragraphs what is involved in my creative process. What is local and immediate is what draws me in. The flora and the fauna, the birds and the insects— particularly, the ways the florae germinate, grow, and decline and the creatures’ behavior as they court, mate, and migrate. I study and draw movements or passages and respond particularly to how their physical forms metaphorically project growth, transition, and adaptation—all which archetypally represent our human condition. These concepts must then be translated into steel and glass, which by necessity require simplification and abstraction. My processes involve heating raw, industrial steel to 2000 degrees. 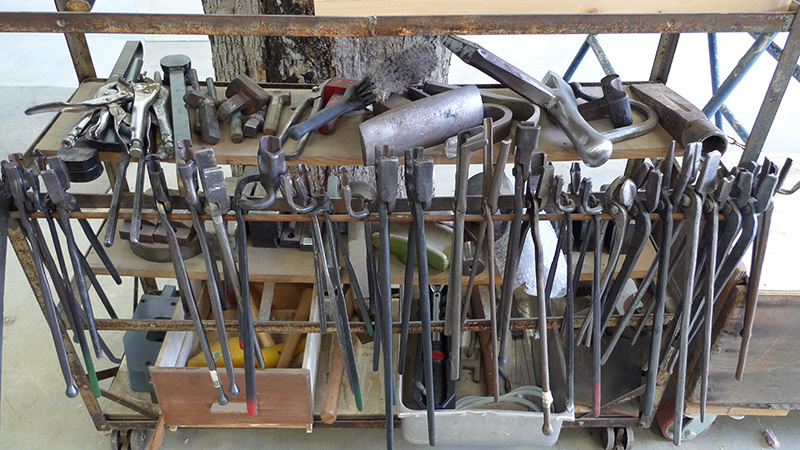 I then use whatever strength I can muster to hammer, twist, and bend it into new forms. Each heat allows for up to 90 seconds of hammering over anvils or stakes or into hollows in tree stumps before it must be put back into the fire. The material is muscular and recalcitrant; its natural molecular structure resists synclastic and anticlastic movement. The irony of an old gal set in her ways, pounding and pleading the iron to shift into a softer, organic form is not lost on me. Our psychological constructs—those both in the light and in the shadow, seem calcified in our bones and shift or change only with tremendous effort. That is both my subject and my process and I hope that the viewer will take the journey with me. 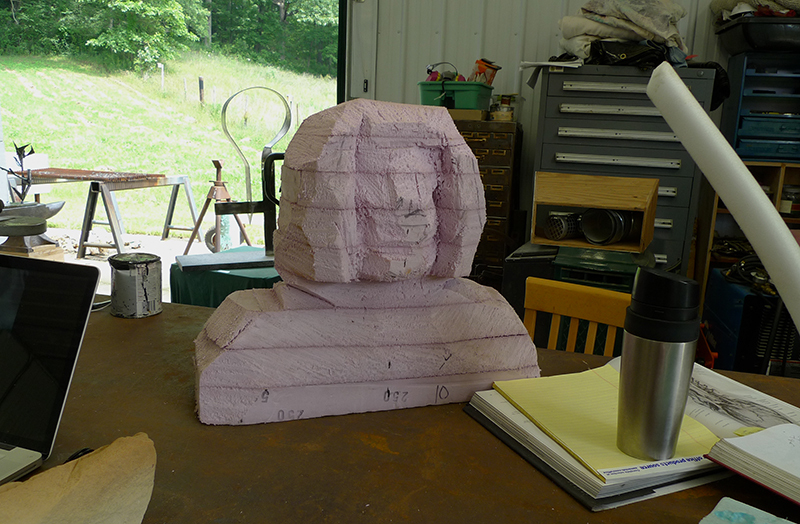 Bloomington Open Studios Tour 2015 was a great success! Bloomington Open Studios Tour 2015 was indeed a robust event. 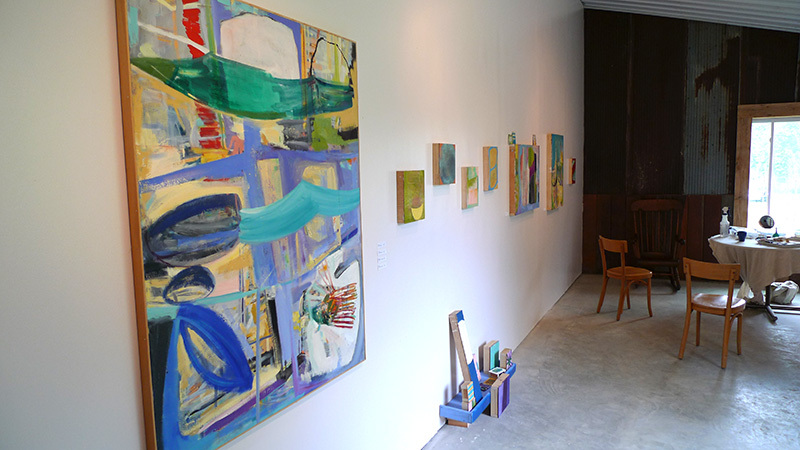 Forty–five enthusiastic artists showed and talked about their work with the public in their own or a friend’s studio. Visitors told us that they had a splendid time looking at and discussing the work with us face–to–face. No pristine white museum walls, lots of in–process works and ideas talked about, demonstrations, teaching/learning inquiries, and some folks went home with a newly acquired work of art! At the end of the day(s) we were tired but pumped–up from so much contact with the public. You see, most of us work in solitary, struggling through our conceptual, aesthetic, and technical problems on our own. Months can go by without interaction with someone else about our work. Being that a work of art requires an audience in order to fulfill its purpose, this was a fantastic opportunity to expand our audiences. I invited two tough and talented artists to show in our studio for BOST 2015: an improvisational oil painter Sarah Pearce and thoughtful and sometimes sardonic cast iron sculptor Bert Gilbert. 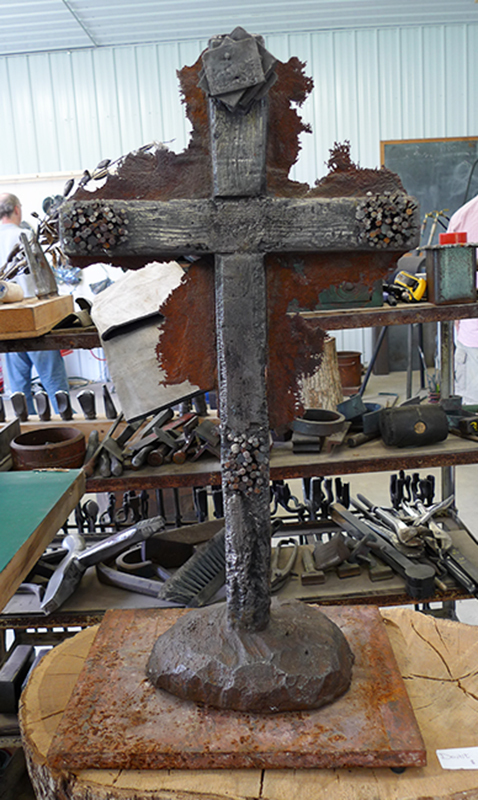 Sarah showed in our teaching/exhibition space and Bert shared my metal fab/smithy with me. We threw open the doors and sunlight and folks rolled in. Conversations ensued all day and into the evenings. Relationships were forged. Artwork unfolded. This was a great weekend! Thanks to all of you who visited for helping to make it a success! The activity of the marsh became more sedate, its sounds grew guttural and closer to the ground, its cool coloration shifted into a warmed and luminous yellow ochre, and its playful character opened up into that of a numinous vessel. This bird was torchformed of Borosilcate glass and sand-blasted. She is destined to become a part of a steel sculptural piece.